A 15×15 map of the Arabian Peninsula. The time frame is 1930 to 2012 beginning with the discovery of oil in Saudi Arabia. This map includes new buildings, goods, and industries including pipe, dates, import goods, pilgrims, palaces, and holy shrines. Cars and locomotives have been re-skinned to look more like those on the Saudi Railway Org. Event notices include photos of some of the most modern buildings in the world, especially in Mecca and Riyadh, Saudi Arabia and Dubai, UAE. Mysterious Arabic music has been added to give the game a local mood. Credits go to many others including Jancsika, Karsten, Lowell, Slider38, and especially Bobby and Rodea for map components and beta testing. The regional economy is based on oil exports. In the game, oil production is increased by delivery of pipe to oil wells. Oil exports produce gold; gold delivered to a palace yields currency, currency can be delivered to yield pipe and import goods. Late in the game, pilgrims are to be transported from all over the region to Mecca and Medina. The game is intended for experienced players and with AI. I unzipped the ZIP file into an empty UserMaps folder on my mac. But it crashes even before I can begin to play. Any suggestions on how to get through this? howard_raj, I downloaded the Arabia.zip file and it runs fine on my PC. I do not have a Mac, so I don’t know why it doesn’t work on your computer, but I have 2 possibilities. 1. There is one more depth of folders in the zip than necessary. I have had problems before, especally with saves, when the assets files are in folders within folders. I suggest you unzip the download in a temporary folder, open the Arabia_sam_v2 folder and copy just the Arabia folder and its contents to the Usermaps folder. When I did this everything worked fine. 2. I read in the recently posted “Interview with SMR for Mac OSX” that for this version the developers changed the music and its format. 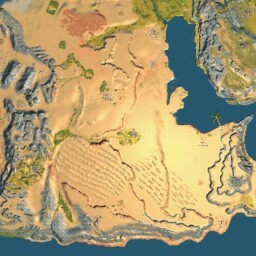 The Arabia map has custom Arabian Music in mp3 files. The music starts at the screen with the Main Menu. If you hear no Arabian Music something is wrong. Crashes before you can start playing the game usually mean the program cannot fine a file it is looking for. If the Mac version cannot handle music the same way the PC version does, then maps with custom music will not run in the Mac version. You could try my Japan map or Sliders My Old Kentucky Home map, both of which have custom music. If neither run, then the problem is the custom music. Good Luck. TMiller howard_raj, I have a mac also and it crash on start. I am not sure what the reason is but there seem to be a problem with the xml files whether it is a permission error or an encoding problem. This appears to be a problem with quite a lot of maps. My solution to howard_raj is to open all the xml files in “TextEdit” and save these files again without editing. If all the files have been saved move it to the UserMap and the game should startup. Please provide feedback I know it works fine on mine. yes it works that way. Great Map. Love that this site has such great content even years after the game came out. This is absolutely my favorite map to date! Great attention to detail. Thanks so much. Thank you for the winderful map, I found it challenge enough without AI because resources are far from city. Also oil – gold – currency – pipe chain are complex enough for me. My first try seem to fail because I start at Mecca. Seems only way to win is to start somewhere east near Oil. Otherwise it’s hard to expand to the east and fullfil Dubai mission. Because if not develop from game start Dubai won’t grow in time to accept Cement and Import Goods. So I’ll give the map 2nd time intended to start east. Really fun and informative map. Thanks! How do you turn off the music? Propably the best map of them all.